From the Marvel Heroes Pop! Vinyl collection by Funko. 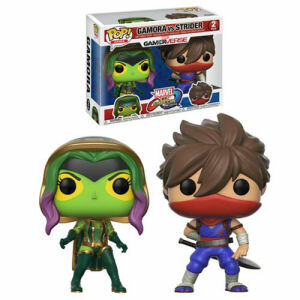 Marvel Vs Capcom Gamora VS Strider Pop! Vinyl 2-Pack. From the Marvel Heroes Pop! Vinyl collection by Funko. Marvel Vs Capcom Gamora VS Strider Pop! Vinyl 2-Pack. Each Pop! Vinyl figure measures 3.75 inches tall. These sylized figures have rotating heads and come in a displayable window box. Funko Marvel Heroes Pop! Vinyl shipping from Canada. No Surprise Border fees or Customs!